Great Basin/Mojave Desert – Jeremy Spoon, Ph.D. The Tribal Revegetation Project embodies a unique collaboration among Department of Energy Office of Environmental Management Nevada Program, a select group of tribal representatives, an environmental anthropologist from Portland State University, and an ecologist from Desert Research Institute. The goal is to provide recommendations for the revegetation of a 92-acre low-level nuclear waster storage area on the Nevada National Security Site. 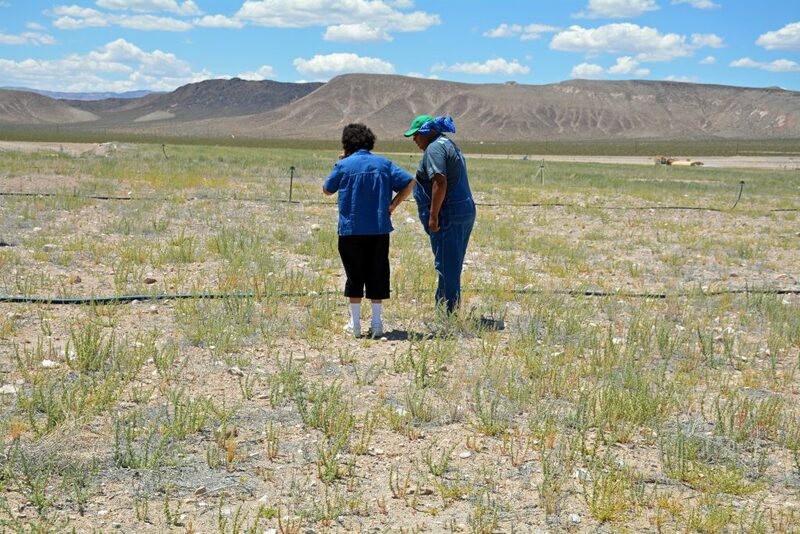 The project includes a Tribal Revegetation Committee composed of two representatives from three culturally affiliated ethnic groups (Southern Paiute, Western Shoshone, and Owens Valley Paiute-Shoshone). In order to provide recommendations, the collaboration is conducting a three-year seed and transplant study that blends Indigenous knowledge and Western science to create novel solutions to this complicated situation. The Gathering for Our Mountains is an annual event, started in 2012, that brings together multiple generations of Nuwuvi (Southern Paiute) with the Forest Service, Fish and Wildlife Service and community supporters to engage in inter-cultural exchange, harvest pine nuts, demonstrate cultural skills, share stories and sing traditional songs. Hosted collaboratively by the federal agencies and the tribes in the Spring Mountains National Recreation Area (SMNRA) and the Desert National Wildlife Refuge Complex (DNWRC) and facilitated by The Mountain Institute and Portland State University, the Gathering reunites Nuwuvi with their ancestral lands and creates new pathways for communication. Multiple generations come together to renew familial ties, make connections with their friends and partners and care for the land. These projects, funded by the Southern Nevada Public Lands Management Act (SNPLMA) and administered by The Mountain Institute utilize a participatory approach with seven nations of Nuwuvi (Southern Paiute) to create interpretive and educational content for planned developments in the Spring Mountains National Recreation Area (SMNRA) and Desert National Wildlife Refuge Complex, Nevada. A Working Group of tribally designated representatives co-conducted the research and writing for the project. The Working Group also created text for the Environmental Impact Statement (EIS) and Vegetation Plan and is part of the Architecture and Engineering Team contracted for the developments. It is our hope that this participation will ensure that the developments are culturally appropriate to the nations that consider the Spring and Sheep Mountains to be their creation places and an important source of resources. This project funded by the Southern Nevada Public Lands Management Act (SNPLMA) and administered by The Mountain Institute created a government-to-government consultation method for seven nations of Nuwuvi (Southern Paiute) and the U.S. Forest and Fish and Wildlife Services. It is also generated a proposed collaborative resource stewardship plan for two protected areas. The project utilized a series of meetings at the protected areas and on native lands with a Working Group of tribally designated representatives and tribal governments. Ecological knowledge was also collected using ethnographic techniques with expert knowledge holders, who also served on a resource stewardship advisory committee that conducted forest surveys. Finally, at the appropriate time of year multi-generational families were invited to both protected areas to harvest pine nuts in pinion-juniper habitats, tell stories, and transmit the native language.